How do you line a crocheted bag? Step 1: Measure the length and width of your bag while it is laying flat. 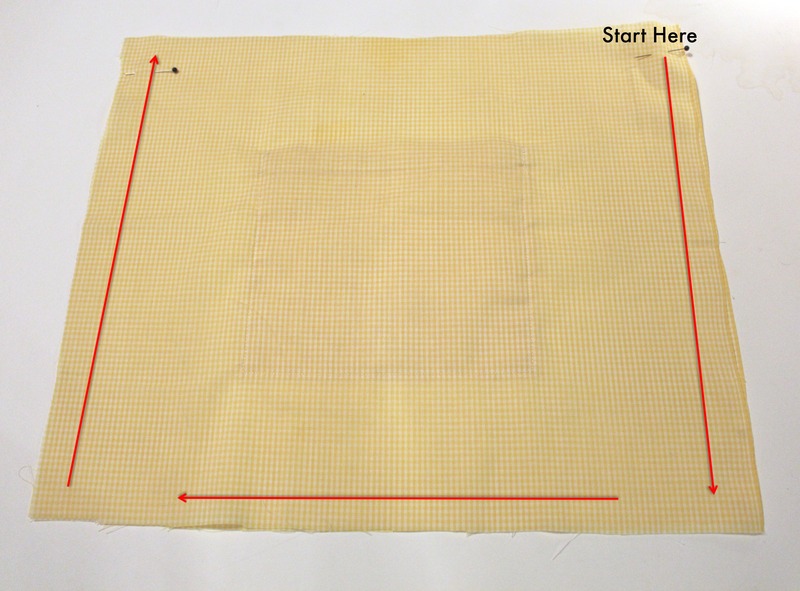 Add 2-3″ at the top and 1/2″ at the sides and bottom for a seam. 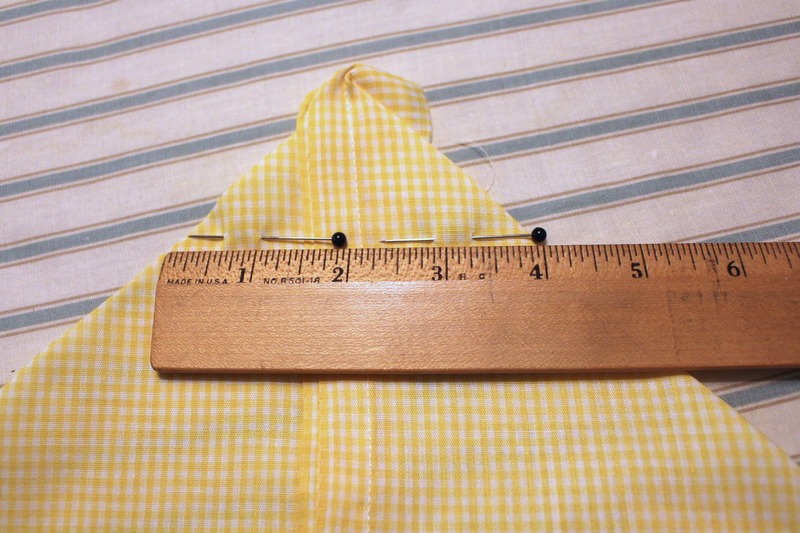 Cut two pieces of fabric to these measurements. Just like a carpenter, measure twice, cut once! Optional – if your liner fabric is thin or you wish a sturdier liner, you can apply interfacing to the wrong sides of the two pieces of fabric after cutting. I like iron-on interfacing for ease, but you can use any type you like. Be sure to follow the manufacturer’s instructions for application. If you just want to reinforce the top of the liner where you will sew it into the bag, you can cut strips of interfacing or buy it in strips and apply around the top edge. 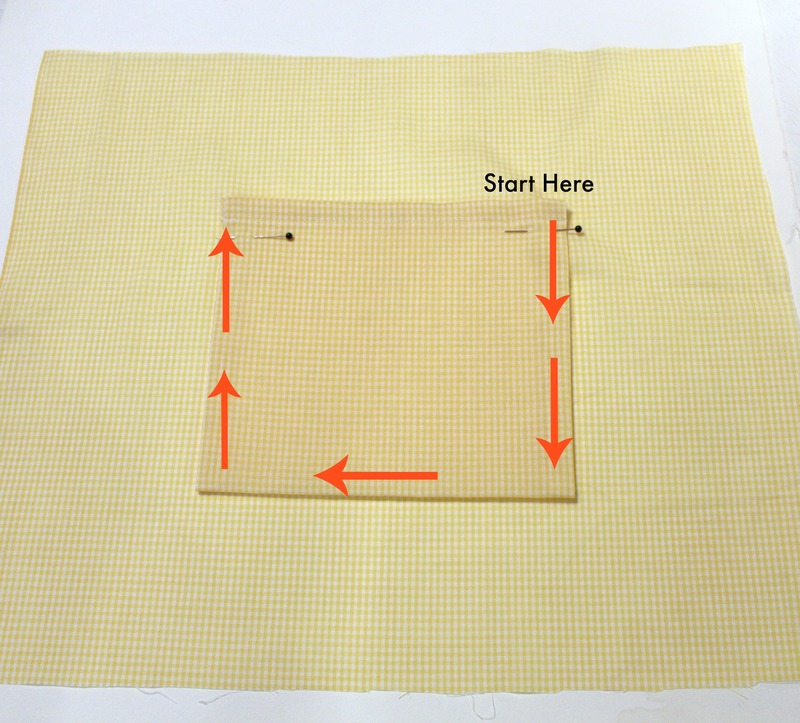 This may be particularly useful if you plan on adding a magnetic closure that is applied through the fabric. Step 2. If you want an inner pocket, cut two pieces of fabric to the desired pocket size plus 1/2″ for seam allowance around all sides. With right sides together, sew around three sides, turn right side out, fold in the seam on the 4th side and sew in place (the pocket will be double thickness). 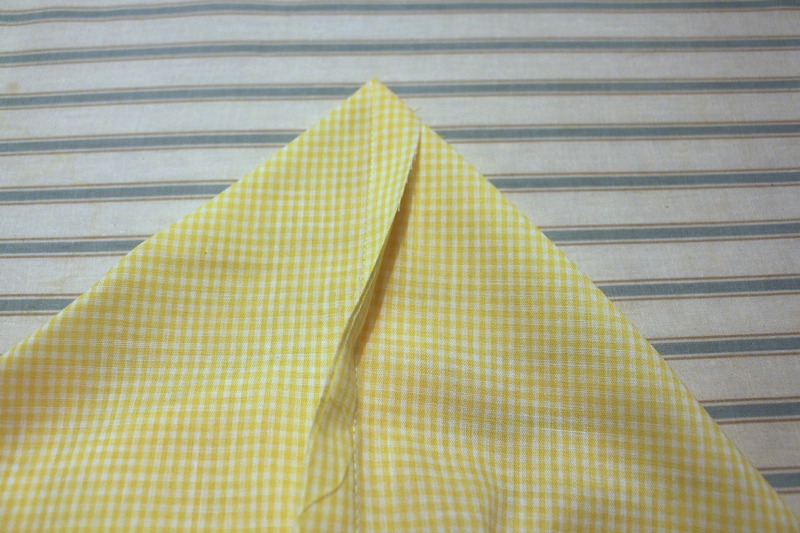 Now, place the pocket in position as desired on the right side of one of the liner pieces. Sew around the sides and bottom of the pocket reinforcing the top edges at the start and end. Step 3: Now put the right sides of the liner together and sew around the sides and bottom of the liner. If you have a pocket in your liner, be sure the opening is facing up when you sew the sides and bottom together. Step 4: If your bag has a flat bottom, you can create a flat bottom in the liner too. Simply measure the depth of the gusset as shown in the picture below. Next, with right sides together match the side seam and bottom seam at the bottom corner of the liner. This will give you a triangle with a point as shown below. Finally, measure the triangle at the point to equal your gusset measurement. Place pins to hold it in place and sew across that line. Repeat for the other corner. Step 5: Fold the top seam down and iron in place. Be sure to measure how much to fold under so that you don’t end up with loose fabric on the liner. Step 6: With wrong sides together, place the liner inside the bag, match up the sides and pin in place. 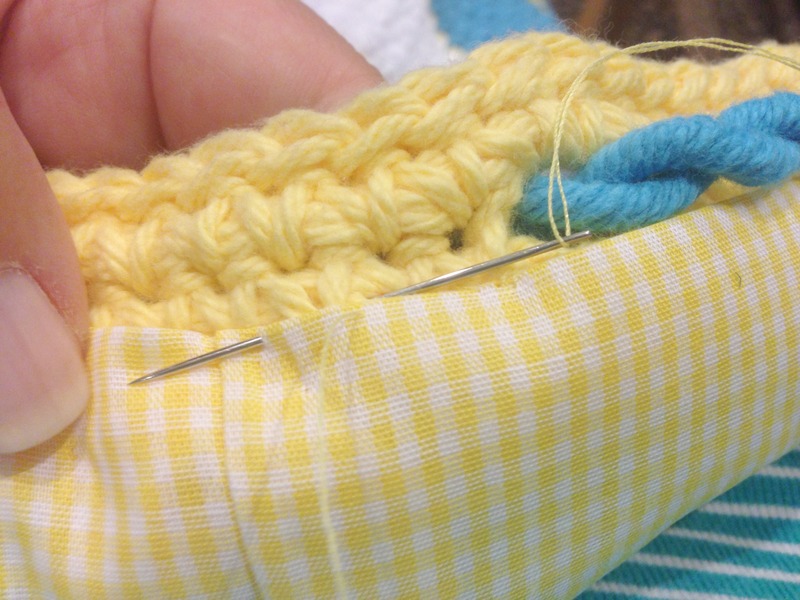 Using needle and thread, stitch it in place around the top of the bag. Voila! A beautifully lined bag. Great tutorials on both the crocheted cotton zipper purse and the lining. 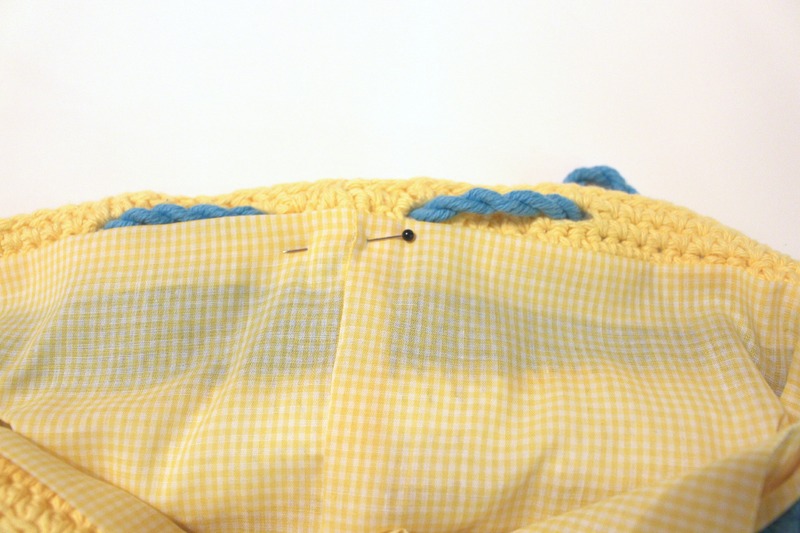 How about a tutorial on how to both line and install a zipper to a crocheted purse. You do good work! you are my hero , your work is beautiful and language is so simple cos my english not that good .Thank you very much. Thanks very much and I will certainly stop by! Your work is so beautiful. I have tried to line bags before and get frustrated. You are talented and have patience. I was laughing to myself about half way through your tutorial because that is about where I would have been ripping apart my project with choice words! Lol. You do make it seem easy though and I will attempt it again…one day…in the future. 🙂 I love your color choices in your projects. You have a wonderful eye for color. Thank you Lisa for all your nice words. Truly, this lining method is very simple and basic and can be used on a wide range of projects. There are of course, more tailored methods and I hope to share them in the future, but this one is just so easy! I’m not sure on your pc/printer but on mine when I hit “print” it then gives me a preview of all the pages and I can choose to print only select pages. Do you have a tutorial for a round bottomed bag? This is so helpful! Definitley will come in handy! Oh I’m glad you liked it and thank you for reblogging! I’ve wanted to attempt to line one of my crocheted bags, but wasn’t quite sure how to go about it – until I read this blog, that is! Wonderful tutorial on lining a bag! Many thanks for posting this along with the great photographs! 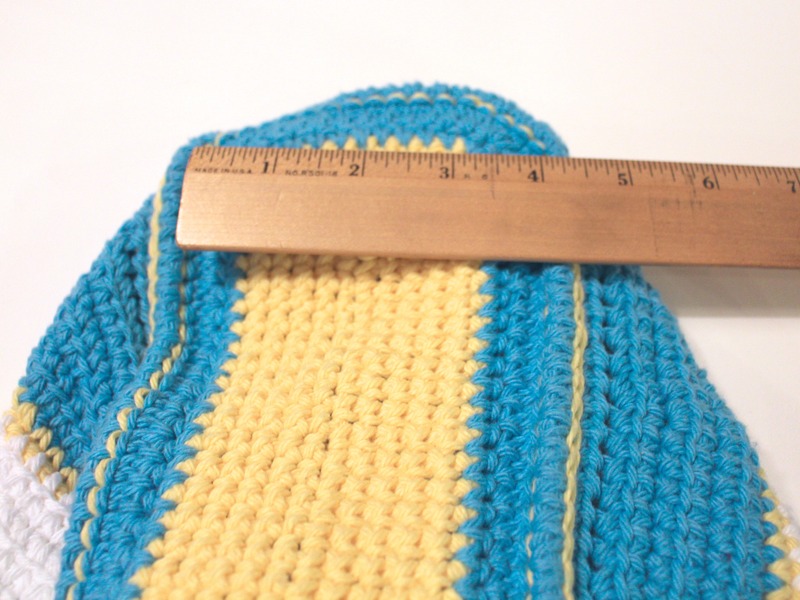 All knit and crochet purses have to be lined and this post is so helpful! ;). :). Thank you. I’m glad you are finding it helpful. I’ve been wondering how to do this for a while now! This is definitely going into my favorites bar for future use! She makes it look so easy….maybe I’ll give it a try again someday.